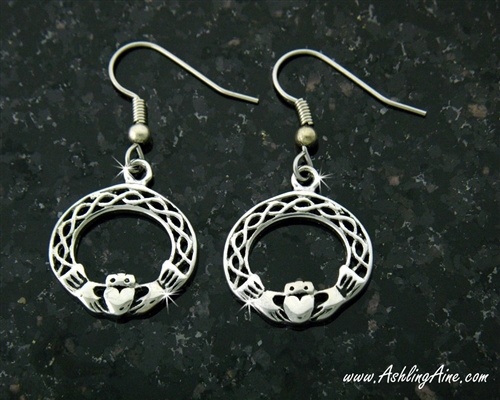 The timeless symbolism of the Irish Claddagh combined with elegant Celtic open weave love knotwork gives our 316 L Stainless Steel Claddagh and Celtic Knotwork Circle earrings a fresh spin on the popular "O" jewelry! Like a woven silver bridge, the knotwork arches over the Claddagh to form an unending loop of Celtic design. - Our Claddagh earrings are made from 316L Stainless steel for a lifetime wear! They measures about 1" X 3/4"